This is a re-publication of the article: Bruce H. Kirmmse: ‘”I am a friend of difficulties” or Søren Kierkegaard against the “Coteries”’, in: Meddelelser fra Thorvaldsens Museum (Communications from the Thorvaldsens Museum) 1997, p. 114-124. Let us start by raising a few questions. The first question has to do with street names. Copenhagen does not have a single square, boulevard, avenue, or street with the name “Søren Kierkegaard Place;” “Søren Kierkegaard Street;” etc. Not even in dignified Frederiksberg, where all sorts of literary nobodies have been immortalized, can one find so much as a Søren Kierkegaard Parking Lot. Of course, one could attempt to explain away this problem by pointing out the unfortunate fact that “Kierkegaard” also means “cemetery” But apart from this, what can account for this lack of geographical appreciation of Søren Kierkegaard? He is, after all, Denmark’s only world-class philosopher, and with Hans Christian Andersen, Niels Bohr, and perhaps Karen Blixen, he is certainly one of the very few Danes who is actually well-known outside of Denmark (fig. 74). Why has Copenhagen neglected and belittled one of its most world-famous scions? And then some religious questions? Is Denmark a Christian country? And in any event, what does an adjective like “Christian” mean when it is used in conjunction with a noun like “Denmark” or “country?” Does Denmark have a State Church? An “established church?” If a “People’s Church” isn’t a State Church, then what is it? What is the relation between “the people”, “the Danish people,” and “the church” “The Danish People’s Church?” If the church is really the People’s Church, and the church is Christian, doesn’t that mean that the people must obviously be a Christian people? Can one be a Dane, a real Dane, a member of “the Danish people” if one is not a member of the People’s Church? And this is not only a matter of a few thousand Jews, reformed Christians, and Catholics (and, more recently, Muslims). The question is whether there is a Danishness which exists quite apart from Christianity. And what is the relationship between an inherited body of cultural material, a society’s collective continuity, and the existence of an individual person in the present? The above questions can best be answered in connection with one another. The Golden Age was profoundly conservative. It was the response of the Danish cultural elite to the approach of modernity, to the inevitable arrival of the new mass society, to the faceless anonymity of a market economy and a democratic polity. The Golden Age evinced a belief that despite these changes, modernity’s dangers could be navigated by steadfastly keeping faith with the depth and integrity of the human personality. To this extent, Søren Kierkegaard was in step with the Golden Age. But in emergencies – and there were emergencies – the conservative old cultural hierarchy had to take refuge in compromise solutions. Uncomfortable situations had to be covered with a veil of ambiguity, sometimes even with hypocrisy and lies. But etiquette and good form, the appearance of continuity with the old order, had to be maintained regardless of the cost. And here Søren Kierkegaard was out of step. All this business about Christendom, Christian states, countries, a Christian world, State Church, People’s Church, etc. is removed from reality by the power of imagination. It is an imaginary construction, and from a Christian point of view, it is such a corrupting form of imagination that the fitting motto is: Imagination is worse than pestilence. Fig. 74. 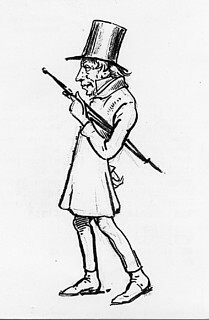 Wilhelm Marstrand (1810-1873): Caricature of Søren Kierkegaard, undated. Pencil and pen. 300 X 135 mm. Frederiksborgmuseet, Hillerød. lnv. no. A 5714. You common man! ... For the sake of God in Heaven and by everything that is holy, there is one thing I implore you to do: Avoid the pastors, avoid them, these disgusting creatures, whose way of making a living is to hinder you from even becoming aware of what true Christianity is, and in so doing to transform you – befogged with nonsense and illusions – into what they understand by a true Christian: a paying member of the State Church, the People’s Church, etc. I [have] taken careful aim at the untruth in the coterie, at the illusion, etc. My tactic has always been to sow discord in the coteries …. The great coterie is: Mynster, Heiberg, Martensen, and company …. I am fighting for the individual, and it is true that the kingdom of Denmark has been and remains the most barren ground for this, because here everything is coteries .. ” Even if I abandoned all of my ideas, abandoned my own view of Christianity or the cause of which I am essentially a part – nonetheless, merely to have extirpated all the coteries in Denmark, if it were possible, would be a great service to the country. The attack on the Church toward the end of Kierkegaard’s life was thus the implementation of Kierkegaard’s final frontal assault on the principal coteries of Golden Age Denmark. And it is therefore not surprising that, in letter written to her husband in 1855 (i.e., during Kierkegaard’s attack), Johanne Luise Heiberg could characterize Kierkegaard in passing with just three words: “the faithless beast”. Of course Kierkegaard was faithless when viewed through the eyes of the Golden Age elite: He had seen through the illusory religiosity of his times – and had called attention to it. In fact, Kierkegaard’s accusations against the cultivated elite were generally on the mark. Particularly in matters concerning the relation between Christianity and culture, the Golden Age was characterized, if not by a conspiracy, then at any rate by a suspiciously close sort of solidarity. In what follows we will investigate a signal instance in which the Golden Age elite managed to preserve the “coterie” at the expense of religion (and simple honesty), and in so doing we will see something of the Golden Age tendency to make compromises. The little child Jesus is born again. It is our Savior! It is he! Is joyfully clad in the green of Hope. And suddenly God’s angels sail into the field. Fig. 75. J.L. Lund (1777-1867): Portrait of Adam Oehlenschläger, 1809. Oil on canvas. 49.5×41.5 cm. Frederiksborgmuseet, Hillerød. lnv. no. A 50. Oehlenschläger’s Jesus-Nature poems were immediately attacked as heretical (which they quite clearly were!) by Bishop N. E. Balle, Primate of the Danish State Church. 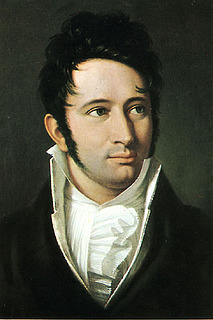 Despite the spectacular success of his first collection of poetry, Digte [Poems] (1802), the ambitious young Adam Oehlenschläger was still vulnerable and was very concerned about the official ecclesiastical reaction to the Jesus-Nature poems. But Oehlenschläger had very good connections, and he could make use of them. He was engaged to Christiane Heger, who was the younger sister of Kamma (Heger) Rahbek. This meant that the important and very influential literary critic K. L. Rahbek was Oehlenschager’s future brother-in-law. Of at least equal importance was the fact that Oehlenschläger’s circle of friends included such people as the brothers Hans Christian and Anders Sandøe Ørsted (the latter had married Oehlenschläger’s sister in 1802), as well as the very promising young theologian Jacob Peter Mynster, then at his first parish in Spjellerup in southern Zealand. Mynster would prove particularly useful in the present situation. I have certainly wanted to review him, but I also see that it would both be difficult for me to find time for it now, if I am to work on my sermons, and that I can scarcely review him in such a way that both of us and the matter are well-served by it. ... Will you please thank Oehlenschläger sincerely on my behalf, and tell him that if I do not review him – and I have not yet given up the will to do so – he must by no means think that it is out of indifference toward him, toward poetry, or toward his poems. If I do not write a review, it will be only because I have been denied the clarity of internal light which I need in order to be able to do it, and that I thus ought not do it. The most striking passage is surely that in which Mynster states that he finds himself unable to review Oehlenschläger “in such a way that both of us and the matter are well-served by it.” In other words, Mynster will not write anything unless he can produce something which is profitable both to Oehlenschläger’s career as a daring and innovative romantic poet and to his own position as the representative of a new sort of piety which was profound, personal, and “orthodox.” The demands of the new romantic poetry and the neo-orthodox, anti-rationalistic view of Christianity would have to be satisfied simultaneously. And this would be difficult to achieve without a shallow compromise or even outright duplicity. I must not forget to tell you that the greetings I gave ”the unconverted Adam” (that is what we are calling him nowadays) on your behalf were not entirely pleasing to him. He has asked me repeatedly if I really couldn’t get you to review him – but I dare not plague you further. As far as I could make out, you have half abandoned your decision to review me, which would hurt me very much, for I must confess to you that I believe that you are the only person in the Kingdom of Denmark (including Norway) capable of doing this. If my entreaty is capable of anything with you, do not give it up. It doesn’t have to be so lengthy, you know. A couple of strong words by a reasonable man can keep a good deal of gossip off the streets …. It always has a good effect and it impresses the crowd when they hear that there are many people who are of the same opinion. It is generally the duty of the few who live together in this benighted age to join together into a league and act with united strength, each according to his conviction and his character. The situation is very clear. It is the quite definite wish of the cultural elite that Mynster “impress the crowd ” with “a couple of strong words” and thus ”keep a good deal of gossip off the streets.” Furthermore, Mynster is flattered with the information that he is ”the only person in the Kingdom of Denmark (including Norway) capable of doing this.” Here, from the innermost circle of the Golden Age elite, we are presented with an unambiguous appeal for support and solidarity, regardless of the personal convictions of the individual involved. To the unconverted Adam, Good Friend! ... Thanks especially for your poems, which have brought me much joy. It will not surprise you that part of what is in the poetry is not entirely according to my lights, but you will learn how much is in accordance with my views if, God willing, I write about them …. It will be particularly difficult for me to say anything reasonable and profitable about the Jesus poem, for I do not possess a philosophy of Christianity, not even fragments of one, that I would need for such a purpose. As soon as I can I will tear myself away from what I am now doing and try what I can. Here Mynster once again protests that he will have a difficult time writing anything which is both “reasonable” (i.e, truthful, according to Mynster’s own innermost conviction) and “profitable” (i.e., for Oehlenschläger’s cause). How can Mynster help his friend and cultural ally Oehlenschläger without being untrue to himself and breaking faith with his own understanding of Christianity? Mynster is in a terrible bind. But when he excuses himself by saying, that he does not even possess “fragments of a philosophy of Christianity” which he could use as guidance in writing a review of “the Jesus poem”- this is simply untrue – untrue, that is, if Mynster’s posthumously published autobiography, Meddelelser om mit Levnet [Communications about My Life], is to be trusted. In that work Mynster writes that two years earlier, that is, in the summer of 1803, “there took place in my inner life a ‘breakthrough’ which was as definite and sudden as has ever taken place in any person’s soul.” And this breakthrough, he tells us, was the beginning of his growth and development as a Christian. Thus, by the summer of 1805 Mynster had at any rate significantly more on which to base his review than he was willing to admit to Oehlenschläger. For the sake of the good cause, I hope that you follow through on your intention [to review Oehlenschläger]. I am already happy about it, in the expectation that your review will lead to others, and that the Good thus will gain one more friend who loudly defends its cause. I send you many greetings from Job …. When he was raising so many difficulties about it, I suggested that he should only really write about one single poem, ‘Jesus’, but he insisted that that wasimpossible unless he wrote an entire philosophy of Christianity. I can very well appreciate that he doesn’t think it an easy thing to review you, and I also have faith that he will acquit himself well with this work, but I cannot stand the fact that it is taking so long. Here it is made patently clear that the attention of the cultural elite was focussed on the Jesus-Nature poems and only on those poems, concerning which, precisely because of their obvious pantheism, Mynster had his greatest misgivings. And, of course, it was also precisely because of this same pantheism that Oehlenschläger and company had great need of support from this “orthodox” pastor. Which burns everywhere with holy splendor. Which draws all hearts toward it. Well worth being honored among men. Gladly to the splendor of the spring! Mynster’s review-poem speaks for itself. He had finally managed to find a way to write a review “in such a way that both of us and the matter are wellserved by it.” Mynster carefully and consistently chose to interpret Oehlenschläger as a more or less or orthodox Christian, and the reader of his review cannot see the least hint of any of the scruples with which Mynster had struggled. As a reward for having compromised his Christian conscience, Mynster was named a first –class member of the inner circle of the Golden Age. In October 1805 Mynster received K. L. Rahbek’s thanks: “Thank you for the poetic review of ‘the unconverted’ which you sent.” Furthermore, Rahbek explains, despite the fact that his [Rahbek’s] own literary point of view is quite different from Oehlenschläger’s, he has decided to write yet another review of his future brother-in-Iaw’s work, and here again, for reasons which are frankly rooted in cultural politics rather than in aesthetics and literary criticism: In the absence of others and in fear of worse, ... perhaps a favorable review by a man who does not share Oehlenschläger’s creed in other respects might not serve Oehlenschläger poorly at the present moment.” This was the sort of mutual cohesiveness which typified the coteries of the Golden Age. Finally, almost two years later (1807), Oehlenschläger thanked Mynster directly and once again emphasized in no uncertain terms that Mynster was one of the Golden Age’s ”rare few”: “Thank you now, personally, for your beautiful poem to me! It has caused me profound joy. One of the greatest rewards an artist has is that the noble, rare individuals in his time know and treasure him. I think that one of my greatest joys will be to associate with you when I return home and to count you among my best friends.” Thus was the ambitious but troubled Mynster rewarded for his support for Oehlenschläger at a very critical juncture. Disappears and will never again come to the North. One finds but churches and cloisters. Which recall the extinguished flames of antiquity. We continually experience in these times how easily, particularly for shrewd thinking, the living God is transformed into Nature, a universe, an infinite force, a certain divine something that penetrates the whole, or whatever other notions these people make for themselves, when they take the shadow for the being, the ray of light which shines upon the creation for the eternal source of light. When the bards are silent in a country, thought and labor increasingly become attached to mere temporal advantages and pleasures; the longing of the spirit is extinguished, its wings are paralyzed. Then the consuming passions burst forth untamed; the flame of discord burns; rebellion howls; mockers of God break the bonds of modesty. But if, in our country, in the midst of turbulent and troubled times, so many noble strivings of the spirit are to be seen everywhere; if there is courage in danger; if, in spite of many different conflicts, the people still stand united around their king; if there is still love and joy in life; if so many ears are still open to the serious voice of the Law, so many hearts open to the soothing voice of the Gospel – this is due in large measure to you [Adam Oehlenschläger], you who for so many years occupied an elevated place among the influential men of this people! There must be no narrow-minded quibbling with poets such as Oehlenschläger because, however diluted it might be, his ”Christianity;’ spreads its scent over society and makes our lives more cozy and comfortable – not to mention socially secure and orderly. The quasi-Christianity of the Golden Age lessened the dangers and dampened the shocks of change – and that was certainly quite a benefit. Your presentation of my poetic work has lifted me up in my own eyes, as it were, and truly seems to be pretty near the most precious reward I have yet received for it. However numerous those may be who now and then count themselves as part of one’s public, fundamentally one really writes only for a very small number of readers. You are the first of these few from whom I have received recognition about which I can truly be proud and happy, and I predict that from now on when I write something new, you will- even more than in the past – be for me the representative of the few whom I especially seek to please. The pattern for Golden Age Christendom is clear:The theologian provides assurances that the poet is within the pale of Christian respectability, and the poet installs the theologian on the Parnassus of culture. [Heiberg was] an arrow and a shield, a protector against crudity and barbarism …. When the poets fall silent, then a people can easily develop a spirit for which sensual well-being and temporal utility and tangible goods and earthly gain are the highest, indeed the only reality. Once again, the Golden Age pattern is clear: The coteries stick together in the fight against “barbarism,” and any religious scruples or doubts evaporate in the heat of cultural battle. The entire history of Scandinavia shows the preparations for this, shows me the hand of Providence, which can never err and which cannot be prevented from reaching its goaL … Despite all visible signs, the dead of Denmark are only slumbering and will now suddenly arise …. The observation of the present shows me that if God’s Word will endure, a miraculous awakening must occur, and it is not merely my ancestry which has nourished my hope of seeing this happen in Scandinavia – it is all of human history that points to it like the finger of God …. Denmark is history’s Palestine. When in 1848 Denmark performed the daring feat of transferring power to the entire people, it was not in order to place the guidance of the state in the hands of unenlightened common peasants, even less to turn it over to self-serving and devious demagogues. It is the talented, the cultivated, and the well-to-do who in every civilized society have the dominant voice in the guidance of public affairs, and all that equality can require and can do is to make it as easy as possible for every talented person to acquire cultivation and wealth, and thereby respect and influence. These were the big guns of the conservative mainstream of the Golden Age: in the first generation, the poet Oehlenschläger and the theologian Mynster; and in the second generation, the poet Heiberg and the theologian Martensen. But if, according to Søren Kierkegaard, they constituted nothing less than a self-satisfied mutual admiration society, which found it convenient to call upon the name of Christianity; and if (again, according to Kierkegaard) neither Grundtvig nor Lehmann was a serviceable alternative; that is, if neither the Golden Age’s conservative mainstream nor either of the two groups which were its principal opponents, the Grundtvigians and the liberals, were acceptable – then what could Kierkegaard offer to his times instead? At this point it is useful to present a brief and necessarily simplified schematic overview of the complex mosaic of Golden Age culture and to situate Søren Kierkegaard within this schema. The complexity of Golden Age cultural phenomena can perhaps be best simplified by posing two questions, one concerning history, and one concerning culture. If these two questions are made to serve as the two axes in a square diagram, it will be seen that the various possible pairings of the two sets of alternative answers group themselves into four fields, each representing a basic Golden Age cultural position. The conservative Golden Age mainstream (Oehlenschläger, Mynster, Heiberg, Martensen, et at’.) was romantic in its view of history and mandarin in its view of culture. The liberals present a less clear-cut profile, but at least a sizable proportion of them took their stand on Enlightenment principles, and this included a scepticism about any ultimate significance of history, i.e., an agnostic position on the meaning of history. But despite their parliamentarism, these liberals, stemming as they did from the urban elite class, had a fundamentally mandarin view of culture. The case of Grundtvig and his followers is fairly clearcut: They were romantic in their view of history and democratic in their view of culture. 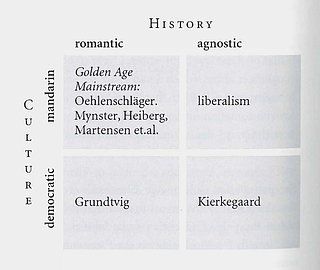 It will be noted that each of the two major groups – the liberals and the Grundtvigians – who constituted the principal alternatives to the regnant conservative mainstream of the Golden Age were nonetheless in agreement with that mainstream on one or the other of the two questions that have been posed regarding history and culture. There is a fourth possibility in our diagram, however. This would be in the diagram field diagonally opposite the field in which the conservative Golden Age mainstream is situated, and thus diametrically opposed to the mainstream’s romantic view of history and its mandarin view of culture. This position of radical opposition to the Golden Age mainstream would offer an agnostic answer to the question of the meaning of history and a democratic answer to the question regarding the nature of culture. This is a good description of the views of Søren Kierkegaard, who was an absolute opponent of the Christian cultural synthesis put forward by the coteries who dominated Golden Age Denmark. While [faith] can be grasped and held fast by the most simple person, it is only all the more difficult for the cultivated person to attain. 0, wonderful, inspiring Christian humanity: That which is highest is common to all people. [S]ince … cultivation and all that sort of thing have made it so extremely easy to be a Christian, it is certainly proper that the individual, to the best of his limited abilities, should attempt to make it difficult. ... [T]he more cultivation and knowledge, the more difficult it is to become a Christian. I am a friend of difficulties, especially those with this humorous characteristic: that the most cultivated person, having been through the greatest of exertions, comes essentially no further than the simplest person can come. Fig. 76. 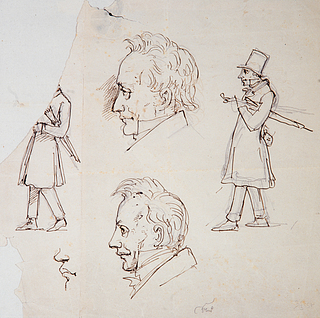 Wilhelm Marstrand: Sketches of Søren Kierkegaard and his father(? ), undated. Pencil and pen. 209×205 mm. Private Collection. This egalitarian, anti-elitist position was characteristic of Kierkegaard from 1846 all the way until his death, and it was one of the cornerstones of his attack on the Church, in which he mounted a furious assault on the cliques and coteries of the cultivated elite. It is fitting to close with Kierkegaard’s last word to his Golden Age contemporaries (and to us), from the final, posthumous issue of his Moment: You common man! I have not cut off my life from yours. You know it, I have lived in the streets and am known by everyone. Moreover, I have never amounted to anything and am possessed of no class egoism. So, if I belong to anyone, I must belong to you, you common man. (fig. 76).